Three years ago, in February 2012, Angel Garden tried to leave a comment on my first post on Steiner Schools. That comment was held up my moderation queue as it contained a number of external links. Within a short space of time, Angel and her husband, Steve Paris, accused me of censorship repeatedly on twitter, blogs and video. After a somewhat incredible sequence of events, the couple issued civil proceedings against me in January 2014. Included in their list of complaints were claims of harassment, misrepresentation, fraud and defamation. There was also a request for an immediate injunction – a serious matter as it required immediate attention. The couple were also suing Melanie Byng and her husband, Professor Richard Byng for similar concerns. Melanie had also written a series of articles on Steiner education that were published on Professor David Colquhoun’s blog Improbable Science. The Byng family had initially formed a cordial relationship with the Claimants, inviting Paris and Garden to their home in Devon to visit a democratic school their son had attended. The Claimants had reported a negative experience of their children’s Steiner school in New Zealand and democratic schools internationally can be an alternative for ex-Steiner pupils bruised by Steiner education. However, the nascent friendship between the Byngs and the Claimants came to an end after a visit of the Byngs’ eldest child to the Claimants’ house in the South West of France. As the Judge said, for ‘teenage reasons’ he wanted to return early. 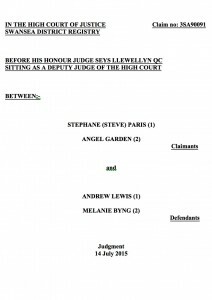 Initially, Angel Garden and Steve Paris (the Claimants) were acting as litigants in person. That is, they were not being represented or advised by a legal team. Fortunately, we were able to obtain representation from the legal firm Bryan Cave, and specifically, Robert Dougans and Serena Cooke, as well as the barrister Jonathan Price. (There are several people we need to thank over this.) However, shortly afterwards, the Claimants were able to obtain the services of Swansea based legal firm, Douglas-Jones Mercer. Their first act was to thoroughly streamline the claim to one of defamation. Also, Professor Byng was dropped from the claim entirely. Most of the complaints were now gone. However, significant work had been done already and the court awarded large costs against the Claimants for amending their claim. This did not deter the Claimants, and after much work (more of which later) and attempts to settle and mediate, trial was set for March of 2015. However, in January 2015, the Claimants and their legal team parted ways. They were back to representing themselves. Their first act was to try to amend the claim again and to reinstate the allegations of harassment that had been dropped nearly a year previously. At the pre-trial review, the judge His Honour Judge-Seys Llewellyn QC, refused permission for them to do so. This meant we would be facing trial on defamation claims alone. That trial took place over five days in the Swansea District Registry of the High Court where Robert Dougans of Bryan Cave and Jonathan Price of Doughty Street Chambers represented us. The defamation claims against me referred to a blog post and a few tweets. In this blog post, I had reproduced a letter I had received from Paris and Garden where they had threatened me with legal action over unspecified actions. I gave a short description of the background of the couple and our dispute and followed it with a curt response. “They claim their children were expelled because they were being bullied. I understand the school says it was because of the parents’ behaviour…. Since February, I have ignored and filtered out their constant harassment by blog tweet and video both of myself and of others”. I had also made a couple of tweets after the couple had turned up unexpectedly in a Skeptics in the Pub talk I was giving in Bath. I had thought the couple lived in New Zealand, so this was a surprise. Just as the Q&A session was starting they approached me and tried to ‘serve’ me with some papers. I left the meeting without continuing the Q&A. @zzzoeey, Thank you. Most Angels will be welcome. The fallen Angels of harassment will not. Melanie Byng was being sued for defamation for tweeting links to the above blog post. She also retweeted a tweet made by Maria MacLachlan under the twitter name @Skepticat_UK, who was responding to the above blog post. Neither the original author, Maria, nor the two other people who retweeted her tweet were sued. Therein, for me, lies the clue to these extraordinary claims. At trial, the Claimants tried to show that both Melanie and I had been involved in extensive, covert action against them. That we had expended great energy trying to discredit them and to exclude them from discussions on Steiner School issues; principally it appeared with the aim of burying what they perceived to be a very important settlement they achieved with a Steiner School in New Zealand. This settlement had been reached after the Claimants had threatened the school with legal action in response to their children’s expulsion. The Judge at trial picked up some of the bizarre aspects of this. Paragraph 205 in the judgement is notable. 205 … When pressed that the Second Defendant [Melanie Byng] had not in fact publicly commented in any way about the Claimants in any post or tweet, the Claimant stated that her silence was “highly aggressive”. This is quite remarkable. Indeed, during the nearly three years of dispute with the couple, it appeared to be our lack of engagement with them or others about them over their dispute with a Steiner School in New Zealand, or perhaps our failure to publicise their view of this dispute, that was the cause for their actions against us. The fact that I did not write about them or speak about their case was somehow a Great Wrong. So, today, the judgement has finally been handed down from the Court and none of the claims have been successful. We have won. This is something of a relief. I will not go into all the details. The judgement ran to 59 pages. In court, the Judge noted that bundles of papers from the Claimants amounted to 24 arch lever files. There was an enormous amount of work involved. Perhaps later I may talk about some of the more interesting technical aspects concerning the nature of publications on twitter, retweets and @replies – but that is not for now. A defence in a libel case is layered in that the Claimants have to show several things including the nature and extent of publication, the defamatory meanings, and in this case, that malice was intended in our publications. We on the other hand had layered defences including truth and justification and showing ‘qualified privilege’ in what we wrote was a defence to an attack from the claimants. The judgement goes into all the details. Some thoughts on all of this. Libel trials are the nuclear weapons of dispute resolution. They are almost unstoppable once the trigger is pulled and cause massive destruction way beyond the value of any disputed damages that may have occurred. Costs are astronomical. I wrote about this issue several years ago when campaigning against current libel laws. Most libel cases never get to court; the costs and risks for both sides are far too high. Many powerful or unscrupulous people use these nightmarish risks as a weapon to coerce others; ill conceived and illiberal claims are designed to silence through fear. As a defendant, you are wise to settle as early as possible, no matter if it is unjust, in order to avoid the terrible consequences of the threat being seen through. This was not a case of high principles for us. We were not defending ourselves against a cold and amoral corporate entity defending its reputation against critics. We were not fighting to stand up for free speech and to able to “speak truth to the powerful”. We were not fighting quacks and charlatans. We were trying to protect the welfare and security of our own children against another family who also had children. There could be no upside to us beyond moving on from this unpleasant episode and protecting our own reputations. At best, a neutral outcome could be achieved. At worst, huge amounts of money could be lost. This case did not easily match other libel cases I have looked at. Silencing us in general did not appear to be a goal. One way in that it did not fit with my previous experience of following such cases was that the defendants’ technique of using the Streisand Effect looked to be completely inappropriate. The Streisand Effect, so-called after a legal complaint from Barbara Streisand where her desire to protect her privacy was thwarted by the adverse publicity of the case, is used typically by defendants to shine a spotlight on the Claimants. If a body is suing to suppress information or prevent scrutiny, then publicising the claim will often resort in more scrutiny and criticism. Paradoxically, starting a libel claim can resort in a destruction of the reputation you are trying to protect. This did not appear to at all appropriate here when it was just families involved. We decided not to publicise our predicament for this very reason. It would also, we thought, give more escape routes for the Claimants to back away from a trial without suffering what Jon Ronson might call a ‘public shaming’. We do not and did not want this to happen. But now the judgement has been handed down, there will be consequences to sort out. Not least costs. We take no pleasure in this and recognise the disproportionate nature of such consequences to the apparent alleged harm. In our defence, we made numerous offers to settle the case in which we said we would not ask the Claimants to pay our legal costs if they dropped the claim against us. All of these were rejected. We were left in a position where there was no way to avoid taking the case to trial. Libel laws in England and Wales were changed in 2013 after a long campaign in the wake of the action by the British Chiropractic Association against Simon Singh. That case never went to trial, but caused a seismic shock in the public acceptance of such obviously unjust laws. We were too late to benefit from the changes in the law. And it is not possible to say just what benefit they may have been. It could have been easier to strike out the original claims sooner as the Claimants would have had a much greater need to establish early on the nature of their alleged damages. Personally, I think it would have still been costly, painful and protracted given the wide concerns the Claimants had. What is still at issue, even in the reformed law, is the nature of costs. The costs in this trial will have been well over six figures. If the Claimants had been represented, that will have been matched. And then there are all the public costs of court time and so on. The total costs in such trials can easily amount to a million pounds. And whilst they do, the ability for libel laws to be used to silence and chill are great. I do not know what the answer is and it is difficult for me to imagine an ideal set of laws and procedures that would have made this experience far less stressful, damaging and time consuming. Other countries have simpler mediation and tribunals schemes that can be held quickly and at low cost. This is good, but the downside to speed and simplicity is the capacity for injustice. I suspect more reform to create higher thresholds of actionability is required together with court procedural reforms to strike out at an early stage manifestly vexatious, trivial, reckless or misconceived claims. I hope that this dispute will now come to end and both sides move on. We feel very lucky in that we have had so much help and support. The demands of a libel case are enormous. It has felt like having two jobs at times. There are huge amounts of documentation to produce, defences to write, witness statements, responses, skeleton arguments, and the awful and scary aspect of disclosure where all relevant documents have to be revealed to the other side. This part has felt like a huge invasion of privacy. We had to review huge volumes of material sent by the Claimants as part of disclosure. Deadlines can be short and the consequences of missing deadlines or not otherwise obeying the orders of the court and the civil proceedings can be catastrophic. There have been times when in retrospect it has not been clear to me how I have juggled by job, my family and this case. This would not have been possible without the extraordinary hard work, generosity, good humour, sound advice (at times, hard to hear) of Serena Cooke and Robert Dougans at Bryan Cave. Our counsel, Jonathan Price of Doughty Street Chambers, was magnificent and I have learned an awful lot from him. At trial, the help and support of David Dougans has to be noted. Outside of the legal team, Simon Singh stands out with his early help, along with David Alan Green, Ben Goldacre and other friends. I spoke little about this trial but was reassured by the listening ear of Richard Wiseman. Most of all, I give my personal thanks too to the Byng Family who I barely knew at the start of all this. We are now going to be lifelong friends. My contribution to this post will be short. 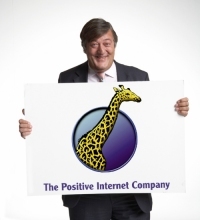 Andy has expressed our position and our thanks to our kind and tolerant legal team. This has been a painful episode for me which began in 2011 and which, I hope, is now drawing to a close. The hardest aspect has been the fear I experienced over months of the Claimants’ repeated attacks on me and fear for my family’s future when faced with a libel trial. The process of disclosure, though common to civil cases, was a shock. I had to disclose a great deal of personal correspondence and to breach the confidentiality of my friends, most notably Alicia Hamberg, who was like me perplexed and worried at the somewhat obsessive attentions of the Claimants. Alicia and I are close friends who write to each other because we live in different countries. There is the embarrassment of causing a legal team and even a Judge the tiresome work of reviewing our conversations, raising their eyebrows at our absurdist humour. Individuals’ time and taxpayers’ money would have been better spent. I take little pleasure in the outcome although it is of course a relief. I wish that it had been possible to halt the Case before causing as much distress for both sides. It would be reassuring if anything could be learned from our experience, perhaps most importantly that the move toward early settlement of libel claims should be more strongly encouraged and facilitated so that any case involving vulnerable individuals could be resolved before entering the adversarial setting of a courtroom. It was a pleasure being a co-defendant of Dr Lewis. Andy was always able to hear me say the same thing several times without telling me to get over myself. The Byngs look forward to having the Lewis family in our lives from now on, we would not be without them.